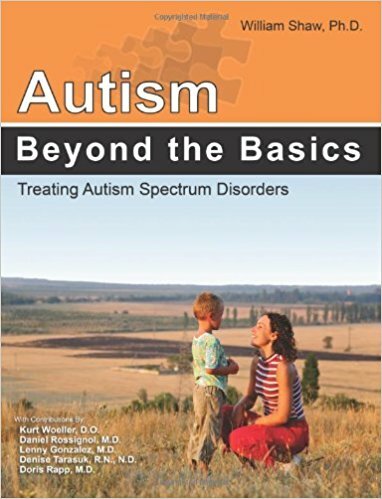 Autism: Beyond the Basics is the long awaited sequel to Dr. William Shaw’s Biological Treatments for Autism and PDD, the groundbreaking book which introduced thousands of families throughout the world – touched by autism – to hope for recovery. As an autism researcher, scientist, biochemist, and laboratory director, William Shaw, Ph.D. has worked over a decade to uncover other causes and potential solutions to the autism epidemic. This new book is a compilation of these research efforts and those of other experts. Parents and physicians seeking more answers will find much food for thought to help improve the lives of individuals with Autism Spectrum Disorders. Some of the many topics covered by Dr. Shaw and his contributing authors include: cholesterol deficiency, carnosine therapy, GI abnormalities, lithium deficiency, hyperbaric oxygen treatment, copper/zinc imbalance, chemical and food sensitivities, oxalate toxicity, homeopathy, and methylcobalamin. The information in this book may be useful not only in the field of autism but nearly any disorder in which some of the symptoms of autism are often present, including Pervasive Developmental Disorder (PDD), Attention Deficit Hyperactivity Disorder (ADHD), Williams Syndrome, Down’s Syndrome with Autistic Symptoms, Rett’s Syndrome, Asperger’s Syndrome, Tuberous Sclerosis, Prader-Willi Syndrome, Tourette Syndrome, Fragile X, and Neurofibromatosis.